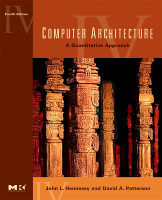 Welcome to the website for Hennessy, Patterson: Computer Architecture: A Quantitative Approach, 4th Edition. 1. Download the CD Resources.zip file from the link here. 2. Unzip these contents on to your desktop as one unique folder. 3. Open "Read_me.txt" for details about the contents.